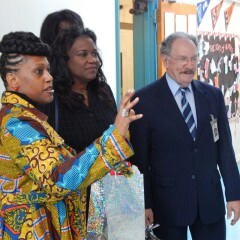 Principal Aresa Allen-Rochester, Superintendent Michelle King and George McKenna at a January visit to Windsor Hills Elementary Math/Science Aerospace Magnet. George McKenna is going into his 55th year as an educator, and he has a lot to say about it. McKenna, who started teaching math at LA Unified in 1962 and now sits on the school board of the second-largest district in the country, said he has some common-sense ideas for making schools better. His style is peppered with homespun anecdotes and folksy humor, sometimes referred to as McKenna-isms, but they also offer solid solutions. McKenna remains critical of some structures of the institution that he now is a leader of, and he is skeptical of Common Core and and various district policies. He has succeeded in implementing some solutions, and he has failed at others. But at 75, he is still trying. Not all of his ideas succeeded. He wrote a bill for the California legislature to consider that would permit parents to take time off from work to visit schools and sit in classrooms. The measure didn’t get out of committees, but he still thinks it’s an important idea. 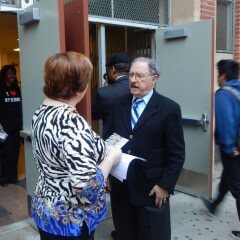 George McKenna talks with a parent. When he took over a failing high school and turned it into Washington Preparatory High School, he had parents sign contracts with students and teachers that outlined specific goals and expectations. He implemented a dress code, cleaned up the graffiti and gang tagging and created an air of respect for each other and among the staff. That’s the model that became the subject of a movie, “The George McKenna Story” in which he is played by Denzel Washington. One of the things McKenna said needs changing in the system is to share practices that work and are replicable. He said that would solve a lot of the problems between charter and traditional schools. He added, “Some charter schools take advantage of exclusivity and they go look for better students and they fill up and say they don’t have any more room. Then they have better test scores. Sometimes it’s separatism and classism that works for them. 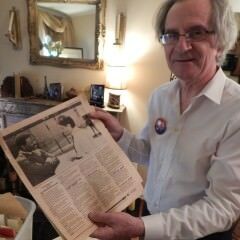 Allan Kakassy with his McKenna archives. At Washington High School, teacher Allan Kakassy was skeptical at first of McKenna’s plans for the teachers. 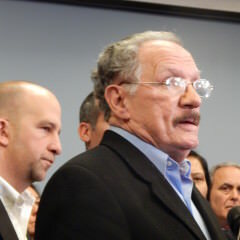 Once the union representative among the teachers, Kakassy said he heard many complaints from teachers who were concerned about extra work that McKenna required of them, including calling parents at home for students who needed more help, working extra hours or weekends to help with tutoring and turning in lessons plans for the next week every Friday afternoon. Kakassy, who was depicted in the movie about McKenna, became one of McKenna’s leading supporters. Now retired and living in the San Fernando Valley, Kakassy keeps a few boxes full of newspaper clippings, photos, videos and other memorabilia of McKenna’s heyday of teaching, and he still serves on committees in an advisory capacity. “There were some teachers who were resistant to what McKenna was doing, but others saw positive changes,” he said. Within five years, only 20 of the 140 teachers at the school when McKenna took over were still there. The rest had either transferred or resigned. McKenna said that it’s important to change the mindset of teachers who may blame the students, or the neighborhoods where they live. “There’s nothing wrong with the kids, we should go with that premise,” McKenna said. McKenna with Steve Zimmer and other board members in December when the district closed the schools due to threats. Another important part of McKenna’s ideal school includes the teachings of Mahatma Gandhi, Martin Luther King Jr. and Jesus. He started social justice programs at Washington and that led to a drop in absenteeism to less than 10 percent because students knew it had become safer to attend classes. He also sees value in including police and probation officers on campus. He had a police officer teach a class and work as an assistant football coach at Washington. 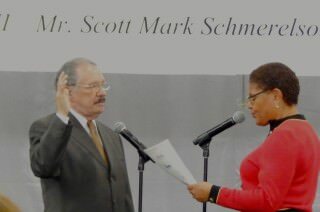 McKenna is sworn in by Congresswoman Karen Bass. McKenna created the Zero Drop-Out resolution last year to eliminate students leaving high school. He also said he wants students to have the idea of going to college instilled at an early age, from first grade. “It should not be if you go to college, but where you’re going to college,” McKenna said. He doesn’t believe that teachers shouldn’t hug or give a child an encouraging pat when they’ve done something good or need a hug. “Sure, I understand that there are strange people, but we’ve developed a system where we can’t touch a child, even if they need a hug, and that’s wrong,” McKenna said.